‘Single-use’describes items whose unchecked proliferation are blamed for damaging the environment. IN A YEAR when coffee giants and supermarkets have come under criticism for their overuse of packing and plastic ‘single-use’ has been named the Collins’ Word of the Year 2018. The dictionary giant has defined ‘single-use’ as a “term that describes items whose unchecked proliferation are blamed for damaging the environment and affecting the food chain”. Single-use refers to products – often plastic – that are ‘made to be used once only’ before disposal. Last month the EU Parliament voted overwhelmingly for an EU-wide ban on single-use plastics such as straws, cutlery, cotton buds and balloon sticks. 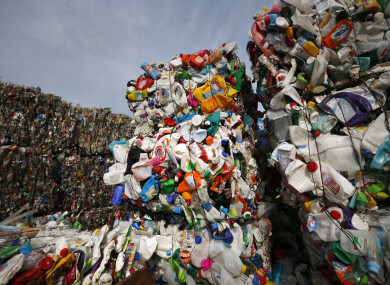 The EU push to crack down on plastic use follows China’s decision to ban imports of foreign waste products for recycling. German supermarket chain Lidl, in a move announced before the vote, won’t sell any single use plastics from next year in a bid to cut down on its environmental footprint. Earlier this year Starbucks, the world’s largest coffee chain, said it would scrap plastic straws by 2020, however its faced criticism over the new plastic lids set to replace them. Public attention on the damage plastic does to our environment grew following an episode of the BBC’s Blue Planet II series which showed images of plastic adrift in the most distant oceans at the end of last year. The future of all life now depends on us. VAR, an abbreviation for video assistant referee. Email “'Single-use': Term used to refer to throw away plastic named Collins word of the year 2018”. Feedback on “'Single-use': Term used to refer to throw away plastic named Collins word of the year 2018”.